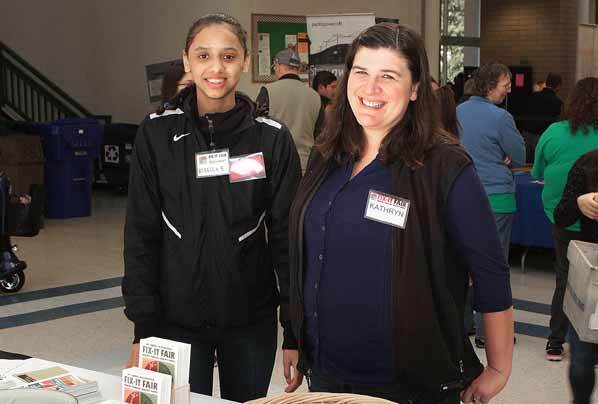 Welcoming visitors to the first Portland Fix-it Fair of the season are Rebecca Benitez and Kathryn Hartinger. 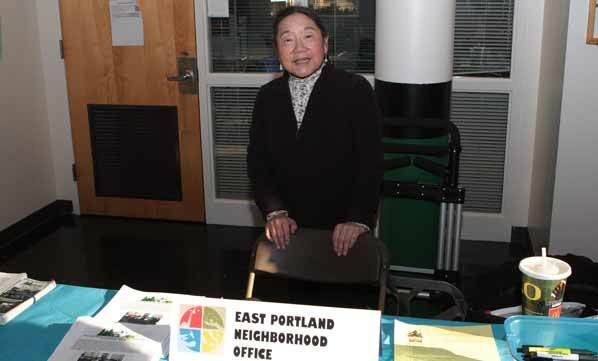 Again this year, the Portland Fix-it Fair, put on by the City of Portland Bureau of Planning & Sustainability (BPS), scheduled two stops in outer East Portland as it caravanned around the city. 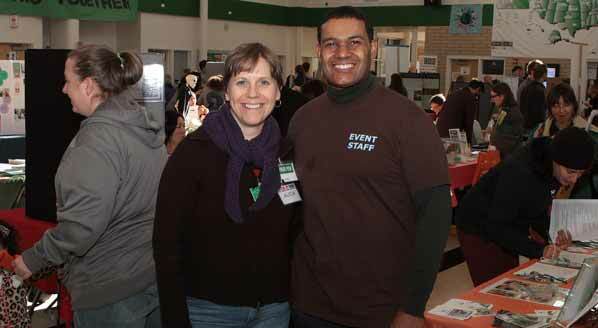 BPS Sustainability Outreach Coordinator Bill Beamer spends a moment during the Parkrose fair with BPS Residential Recycling Outreach Coordinator Alicia Polacok. 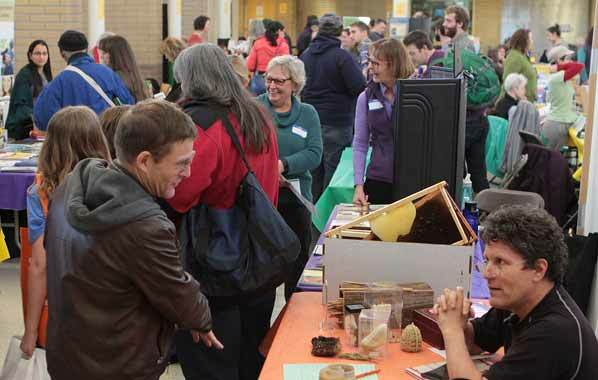 We’re having a great time at our first event of the season here in Parkrose,” said BPS Outreach Coordinator Bill Beamer, as he looked around the Parkrose High School atrium, which was filled with 60 exhibitors. Some 60 exhibitors give advice, and some provide product samples, to Fix-it Fair visitors. New this year, Beamer commented, is a “Financing College” workshop aimed at youth, and mind-body-spirit classes that help to lower stress. 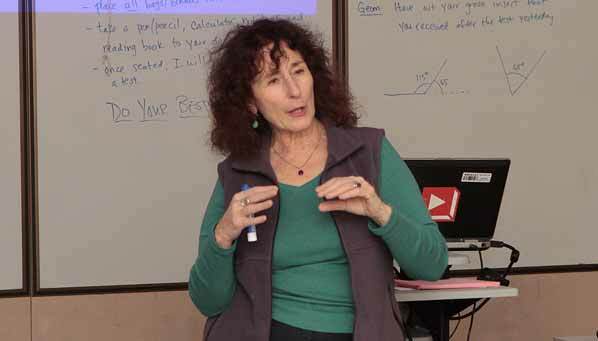 Workshop presenter and author Jacki Gethner gives tips on how to be more relaxed in today’s fast-paced society. 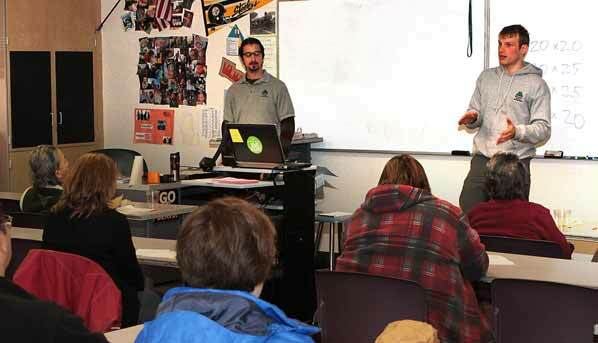 In this class, Multnomah County Weatherization Inspectors Jaycob Padron and Jack Baikov tell how to save money and stay warm during the winter months. In the Repair Café, volunteers of Repair PDX struggle to fix a burned-out “hover-board” – but are successful in restoring lamps and toasters to working order. 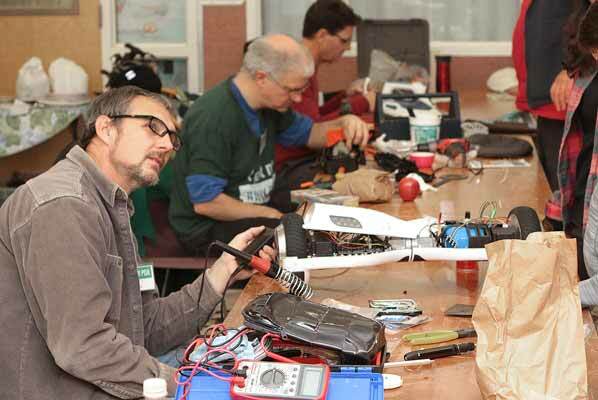 Additionally, Repair PDX volunteers hold what they call a Repair Café, doing their best to fix small electrical appliances, like toasters and lamps, as well as toys and articles of clothing. Keep in mind that while they do their best, they can’t guarantee a complete repair. Free lunch – yes, a FREE lunch! 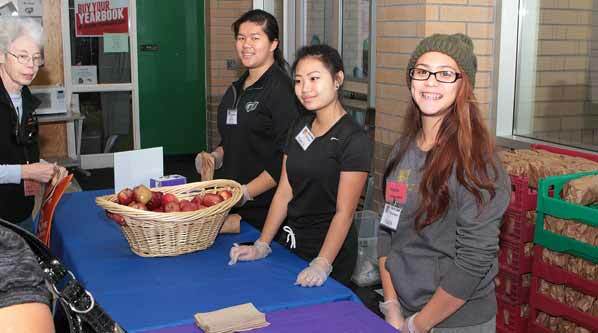 Parkrose Broncos volunteers Erin Appel, Melanie Nguyen and Mayra Cervantes serve a free lunch at the fair. “The best part of the Fix-it Fair for me? Well actually, there are two things that come to mind,” Beamer said. “First, I love working with the schools, students, and the school community; it’s a wonderful thing. More than 40 Parkrose Bronco student volunteers helped us set up the fair. Representing the East Portland Neighborhood Office and the East Portland Action Plan at the fair is volunteer Arlene Kimura. If you have a specific question, contact Beamer at william.beamer@portlandoregon.gov.